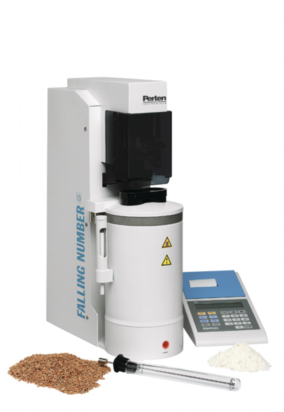 The Falling Number System analyses the alpha-amylase activity in grains and flour to detect sprout damage, to optimise flour enzyme activity and to confirm quality of traded grain. Alpha-amylase activity is vital for final quality of bread, pasta, noodles and malt. Anyone handling wheat, barley, rye or sorghum meant for these applications shall benefit from the Falling Number system. Under conditions of prolonged moisture or rain, grain kernels may begin to germinate, or sprout, while the crop is still standing. Germination begins when kernels absorb water and create enzymes that consume stored starch and protein in the endosperm. The enzymes release sugar from starch and amino acids from proteins which then feed the growing embryo. Alpha-amylase is one of the enzymes produced in the sprouting kernel. Although some alpha-amylase enzyme is present in the embryo or germ of good wheat kernels, at the start of germination the embryo and layers surrounding the starchy endosperm increasingly produce the enzyme. A severely sprout-damaged kernel contains significantly larger amounts of enzyme present in kernels that are in the early stages of germination. Due to this, a wheat sample containing very low levels of severely sprouted kernels may exhibit significantly increased amylase activity. Alpha-amylase converts starch into sugars in the sprouting kernel, and similarly breaks down the starch in wheat flour when mixed with water to make dough. Why measure the alpha-amylase activity? Adverse weather conditions during harvest may cause sprouting. When sprouting occurs the alpha-amylase enzyme develops. The enzyme activity has a significant negative impact on bread and pasta quality and adversely affects the malting process. As little as 5% sprouted grain, mixed with 95% unsprouted grain, can cause the entire mixture to be unwanted. The end-users of wheat, rye and barley suffer greatly when grain is sprout damaged, and need to monitor the ingredients they buy. To prevent sprout damaged grain from entering the production chain, farmers and grain receivals should always test the grain during harvest, in addition to when it’s delivered. The Falling Number method is pre-defined and should be performed in the same way every time. The steps are described below, and are also displayed in the pictures. 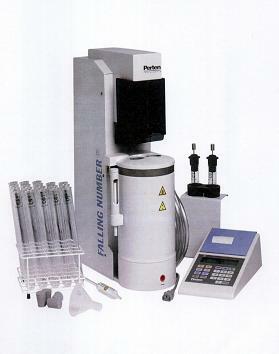 For grain a 300 gram sample is ground in a Laboratory Mill LM 3100 or LM 120 equipped with a 0.8 mm sieve. The large sample is to minimalise sampling error. For flour a representative sample is used. 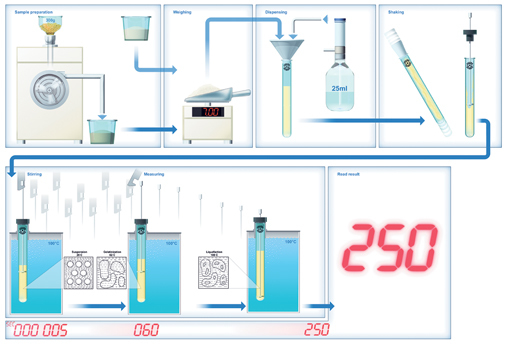 7.0 ± 0.05 g of whole meal or flour is weighed and put into a Viscometer tube. The flour amount should be moisture corrected by measuring the moisture content of the sample. Sample and water are mixed by shaking the tube vigorously to obtain a homogeneous suspension. The total time in seconds from the start of the instrument until the stirrer has fallen a measured distance is registered by the instrument. This is the Falling Number. When the tubes are placed in the boiling water bath, the starch begins to gelatinize and the slurry becomes thicker. The mixing makes sure the gelatinization is consistent throughout the slurry. What also happens at this raised temperature is that the alpha-amylase enzyme starts to break down the starch and the viscosity thus decreases. The amount of starch break-down is dependent on the alpha-amylase activity and this means that the higher the activity of the alpha-amylase the lower the viscosity will be. When the stirrer is dropped, its speed and thus the time it takes it to fall to the bottom, will be determined by the viscosity of the slurry. In other words, the more sprouted the grain was the higher the alpha-amylase activity will be. The higher the alpha-amylase activity the lower the viscosity of the slurry. The lower the viscosity of the slurry the faster the stirrer will sink to the bottom. That is why more sprouted grain results in a lower Falling Number as Falling Number is the time it takes the stirrer to sink to the bottom. Segregation: Save money by avoiding of mixing sound and sprouted grain. Blend Optimization: Blend grains/flours to create product with specific characteristics. Altitude Correction: Automatic recalculation of FN results. Automatic model for double test. Microprocessor controlled with touch screen and USB/LAN connectivity. 20 viscometer tubes and 2 viscometer stirrers included. Automatic model for single test. Microprocessor controlled with display, internal printer and keyboard, RS-232 serial data output. 20 viscometer tubes and 1 viscometer stirrer. Same as above but with the possibility to also operate the Fungal Falling Number method. Automatic model for single tests, incl. 20 viscometer tubes and 1 viscometer stirrer.